A wounderful opportunity to see Rocknives in action! Live demonstration of the strength, the sharpness and the quality of our Kitchen Ceramic Knives as well as the full range of different colour sets and sizes. The Fair will be open from 2pm – 6pm on Tuesday 25th September, prior to the evening Reception. Evening Reception on Tuesday 25th September is from 6.30pm – 9.30pm: Tickets are £20.00 per head for a supper and a glass of champagne. All tickets booked online will be entered into a holiday prize draw (kindly donated by The Zanzibar Collection) The winners will be drawn at 3.30pm on Wednesday 26th September at the 2018 EEC Fair. Rocknife will be featuring the Ceramic Knives and are very excited to be supporting such a valiant cause for the Soldiers Charity. Rocknife are delighted to be part of the event to help raise funds for the Art Fund that is taking place on Wednesday 3rd October 2018 9.30am to 4pm. Rocknife will be at the biggest Christmas Market you will find in London. The Spirit of Christmas Fair, in association with House & Garden, is the perfect place to shop, dine and socialise in style this November. So make sure you visit Rocknife and a demonstration of our Ceramic Knives whilst enjoying these seven glorious days of stylish shopping. The Fair will be open from 9am to 4pm. Free Entry but booking for lunch is essential so call 01749 814 070. 10% of all profits go to charity. Rocknife will be featuring the Ceramic Kitchen Knives and Bamboo Chopping Boards and are very excited to be supporting the event. Rocknife will be featuring at the BBC Good Food Show at the Olympia Grand in London before Christmas. 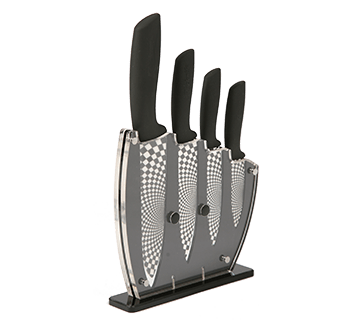 This is the perfect opportunity to see the strength and quality of our kitchen knives and give it to a friend or a loved one for Christmas this year. Rocknife will be featuring their range of Ceramic Knives at the Compton Marbling Christmas Fair in November this year. This Christmas Fair will feature a range of other goodies for all to enjoy including garden and house products to clothes and food. A perfect opportunity for the whole family to come along and see our kitchen knifes in motion, wonderful ideas for Christmas Presents. Rocknife are coming back to the BBC Good Food Show, but this time we will be in Birmingham to show off our range of ceramic knives. This Christmas Fair is set to be a fantastic opportunity for your whole family to come and spend a great day out Christmas Shopping. So, make sure you visit our stand and watch a demonstration of the knives in action. If you walk into a shop to buy a knife, they don't charge you to pop it in the bag and hand it over the counter? 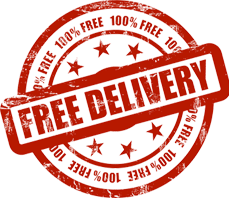 We want to offer you the same excellent service, whether you buy a single Rocknife or a full set, we wont charge you delivery.